How can I enable Ember during the day? So I love f.lux and I've been using it for about a year now. I have always used Incandescent lighting for night and day use as I like to use my computer in the dark. 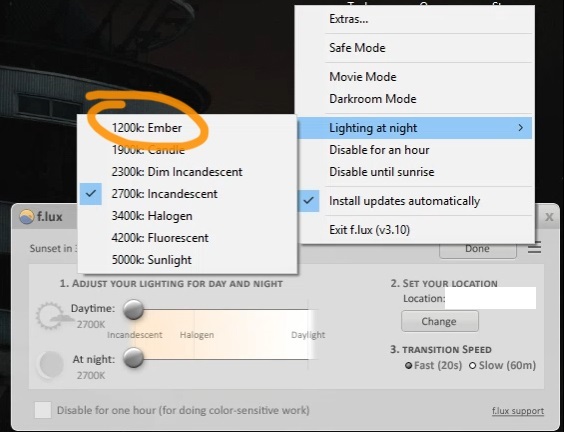 If possible I'd like to go warmer, when looking in the settings I see that you can enable Ember for at night and I'm wondering if it's possible for me to use Ember also during the day as the scroll setting only lets you go down to Incandescent. First, I think it's harmful on our eyes to use a computer in the dark. When the monitor is the only source of light in the room, it can be very stressful and hard on your eyes because now you're staring at the only source of light in your field of vision. It's not good. Before I show you how to use the "Lighting at night" menu during the day, I will say that I don't condone this one bit because it's not good for your eye health. It's far better to have lights on in the room to balance the brightness of your monitor so that your monitor isn't the brightest thing in your field of vision. Your eyes will be able to relax, you'll feel more relaxed, and you won't end up with eye problems later on in life due to using a computer in the dark. I will say one more thing before I show this to you: even Ember at your monitor's lowest brightness in a dark room will be uncomfortable because the monitor is still the only source of light in your field of vision. Do you still want to do this? Or would you rather just turn some lights on and be comfortable and relaxed and stop hurting your eyes? I'll show you how to do it if you insist, but I would rather not see you regret it later in life. I only know how to do it because I am unable to keep a regular day/night schedule where I sleep only at night. So not only did i find out how to use the 'Lighting at night' menu during the day, but I also learned how to simply choose any color temperature I want by simply typing it into the Registry and then restarting the f.lux program itself. However, I can't share these tricks with anyone in good conscience when I know they're doing it because they are using their computer in the dark. @feud_ I agree with the other poster, don't use your computer in the dark. In fact, I'd recommend you take it outside, but the problem there is most screens don't get even HALFWAY (600+ nits) bright enough to even consider using outdoors (on a sunny day). If it's cloudy, I'd get you a bright monitor, and put your computer outside, or get a laptop. Just so you wouldn't be in the dark all day or some of the day. It's not a good habit. I recommend just staying with 2700K in the daytime, it's already very warm. I'm actually in a dark room at the moment, but it's very cloudy and I won't be using it for long bits. Post deleted for personal attack. Keep it civil. @feud_ can you tell us more about why you'd like to use that schedule? Generally we encourage people to aim for brighter daylight and darker nights so there is a clear and regular dark / light rhythm. Our bodies' sensitivity to light changes over the course of the day so screens that are too bright at night are not bright enough during the day, meaning the circadian rhythm can get out of alignment quickly. I am not using my computer in the dark. I am very mindful of my circadian rhythm. I get morning sun & wear blue blockers at night. However, as someone else mentioned, the blue from the computer is even more blue than sunlight. Too much indoor blue light is harmful, causing free radical damage. I would prefer a warmer color even in the daytime. How do I do that with f.lux? @JanSunshine The blue on your computer is not more blue than sunlight when measured. Sunlight is the brightest source of light of all wavelengths we are exposed to, by far. During our night, our light sensitivity increases and the computer screens are bright enough to have a biological effect. We'd actually like to see brighter screens designed for healthy use during the day. Using your computer for 8 hours at full brightness doesn't even come close to how much blue light you are exposed to walking to your car or checking the mail, they're not equivalent. I have always used Incandescent lighting for night and day use as I like to use my computer in the dark. I am not using my computer in the dark. @lorna Would you please just answer the question? @JanSunshine You can either do various tricks,(change your location to somewhere where it's night, or edit the register file) or just download the beta version where you can drag the slider down all the way to 1200 no matter the time of day. Like @feud_ and @JanSunshine, I also came on here to gain a simple answer to this exceedingly simple question, only to find myself entering some Orwellian nightmare. Do you want people to use your app or not? I understand you're trying to enforce a certain commendable methodology here but the application has more uses than regulating CR. If someone asks how to perform what is unquestionably a "simple" function of its enterprise, just tell them. There's no need to to start schooling them on what is and isn't good for them from a clinically biological standpoint, regardless of how objective you're trying to be. You don't know how each individual user interacts chemically with light. You don't have any history of their relationship with it and any unique sensitivities they might encounter; perhaps they have some acute photosensitive epilepsy that requires constant short-wave mediation. The simple fact is: even with the timezone-orientation, f.lux doesn't observe any local environmental information. It doesn't know if it's an overcast day. What about stratospheric anomalies at night? What about astronomical events? Eclipse anyone? No. It's not that sophisticated. Therefore, and until then, it shouldn't necessitate a sophisticated response. Failing all of this, and even if none of their reasons are scientific, it doesn't concern anyone but the poster. You may provide a courteous recommendation, not a sprawling interjection. Analogous to this would be someone asking how to embolden font in MS Word and you proceeding with both an interrogation into why they want to use typographical emphasis and some sanctimonious specifications about when and when not to employ it. I can only presume @Vultux and the other deleted posters held a similar line of enquiry. To anyone still looking for an answer to this: you can't, not with the latest v1984. Go get the beta, or v4.41, or edit your system's registry manually. I'd like to thank @Druathea for this, who isn't even associated with the f.lux team. @blaice Because the forum gets a lot of search traffic, when straight up incorrect information is posted here (e.g. "blue from the computer is even more blue than sunlight"), we work hard to to address it. Thanks for taking the time to share your thoughts. Locking this thread. It previously devolved into name calling and insults and it is dangerous close to going there again.